We have had several very nice early spring days by now with temperatures in the mid-teens. This is what Canadian meteorologists refer to as double digit weather. With the warming weather comes the expectation of the first real colour of the year, especially after the months of dull grays and browns of winter. How we long for that fresh, vibrant new green of springtime! But just a minute, now. We speak of the first blush of spring, and indeed, the very first colours of this new season are red, not green. 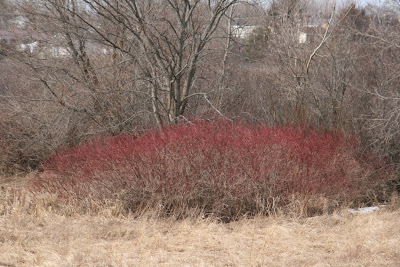 The very first colour that one sees is the bright red of the shrub Red Osier Dogwood (Cornus stolonifera). 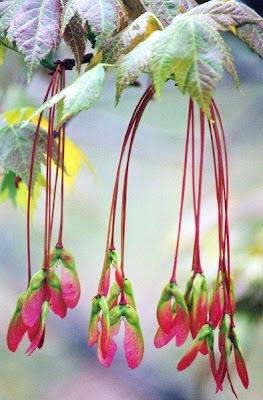 This plant has a bushy appearance and its lime green bark of summer gives way to a wine red colour in winter. This colour becomes an even brighter red at this time of the year just before the buds swell and the leaves appear. The real first blush of spring is a very subtle thing. There will come a day when you look over the woods to see a delicate reddish hue to everything – the first blush. It will only last for a very few days and is a subtle thing so you must be on the lookout for it. 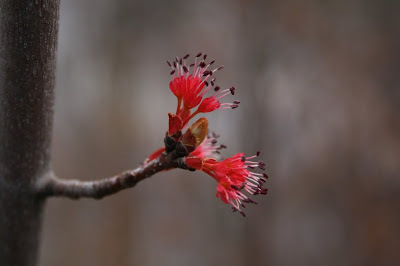 It is made up of millions of buds coming out on the trees, blooming into that first bright inflorescence of spring. I find it very difficult to catch the overall effect in a photograph, but close-up images can be spectacular. Here are the very flowers of the trees in all their glory. Blushes in nature, just like the human variety, are very fleeting. The blush on these maple keys only lasted a few hours. I just happened to be in the right place at the right time for this picture. This is one of my favourite photographs and I find the colours in it to be remarkable. These are the actual un-retouched colours. Just a personal note here. I don’t use Photoshop to enhance my photographs. Ever. I am old school and believe that a photographer should capture the image in the camera, not create an image on the computer. I think the former is photography and the latter is art, or worse, something else altogether. It's gorgeous. I love reds and pinks and now I wish Swiss Spring would come in such beautiful colours. April 22, 2008 at 5:01 a.m.
May 26, 2008 at 12:15 a.m.